Love Photography, then you know how important it is to present your work to the world by the way of photo blogs. We will show you a collection of best wordpress photography themes for your blogging website. 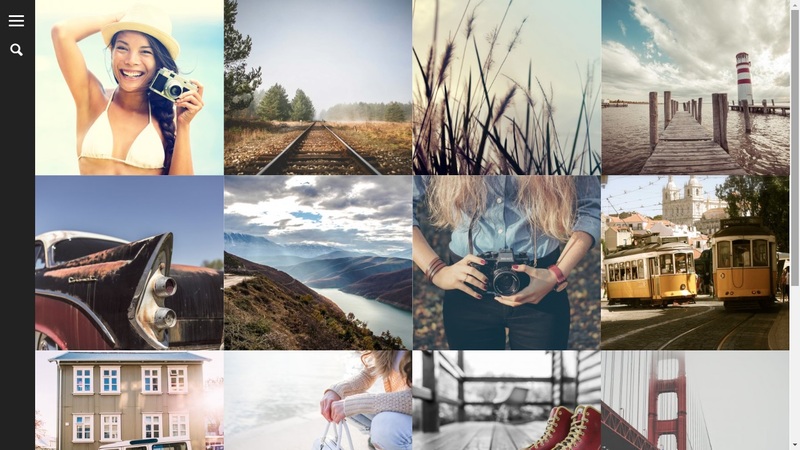 These premium themes will enhance your photo presentation. Best Photography themes are responsive. They are build using HTML5 and CSS3 coding. Easy to customize. Perfect to display your portfolio. Above all have awesome typography. Below are the list of these themes. This is theme based on genesis framework. As you know genesis themes are known for high quality professional websites. Ambience Pro will create awesome WordPress photography website. The theme is easily customizable . It lays bold emphasis on your beautiful photographs and typography. 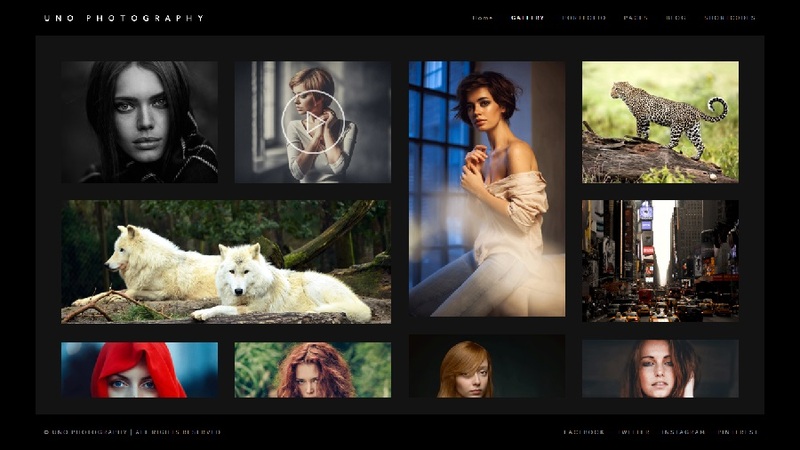 Flipper is a great wordpress theme to showcase your photography talent. Awesome portfolios are showcased. The highlight of the theme is fullscreen slider. 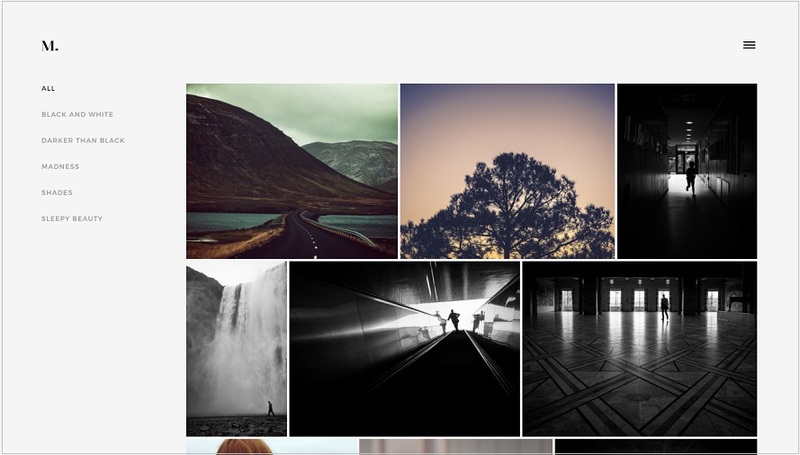 There are plenty of layout options – flow gallery, gallery albums, masonry, stripe page etc. Includes GT3 page builder to make awesome pages. SEO optimized theme is comes with plenty of options – over 600 font awesome icons, retina ready, support for mailchimp etc. 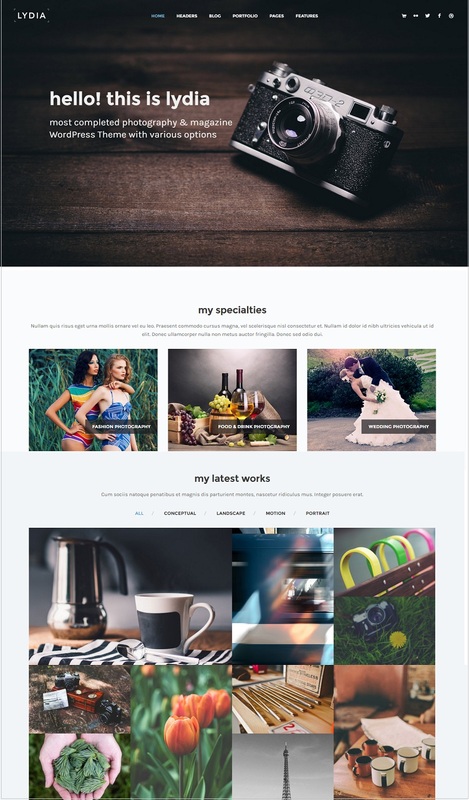 Photography Whizz is a beautiful photography WordPress theme. It gives you 46 demo options to showcase your creative work. Plenty of options to highlight your talent. You can use 24 gallery styles, over 20 page layouts, 8 navigation styles and much more. Includes free paid plugins- visual composer, kaswara, book appointment etc. Using them will create awesome custom page layouts. I like this theme for so much variety in terms of customizing options. The end result is a clean highly optimized photography theme. Clean Photo is one of the best modern WordPress photography themes. It is a mobile responsive theme. You have plenty of options to showcase your portfolios. Some of the options are 3 column layout, 2 columns with filter, and stacked full width. Creating an awesome single portfolio page is easy and beautiful. You can use 2 column layout, full width images layout, sliders with thumbnails. Custom pages can be created by using free included premium plugins The free premium plugins Visual Composer, Slider Revolution, ACF Pro plugin. Menus & headers can be chosen as per one’s requirement. 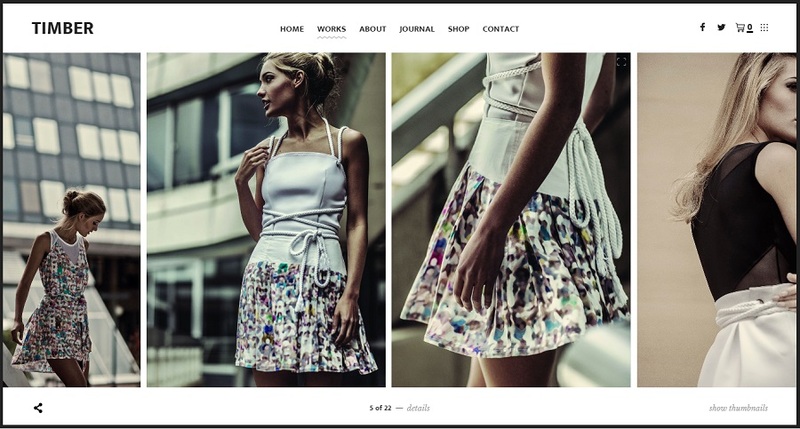 If you are looking to make a website that is a clean, sleek & modern then use this theme. 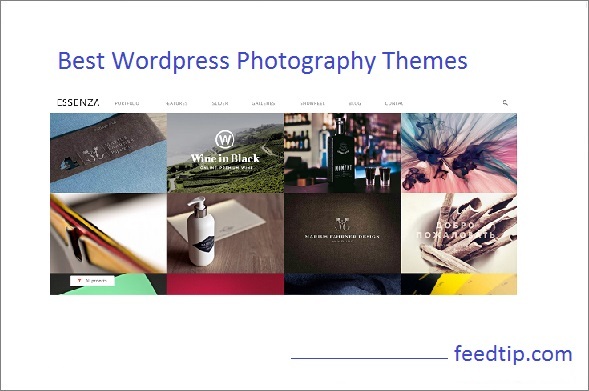 Photography WordPress theme is great theme to present your work in a professional way. It has progressive image loading that makes your website high speed loading. Comes with lot great features like infinite scroll, 2 free premium lightbox plugins, 8 menu layouts, thumbnail hover effects etc. Easy to make customized layouts by using live content builder. 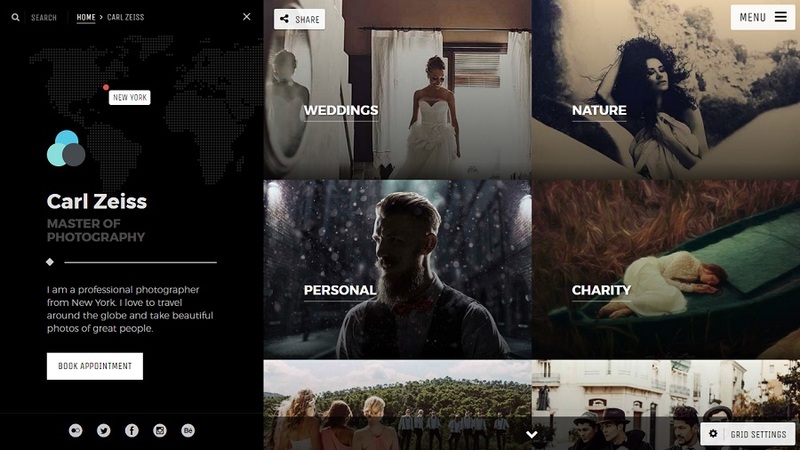 With so many customization options it will make a photography website of your dreams. Built a stylish photography website using this awesome Photo Me theme. Using the live customizer you can customize headers, typography, background, colors etc. There so many options in terms of portfolio layouts, headers, blogs etc. You can make your customized layouts using the drag & drop builder. It has a great mega menu. You can even sell your products as this theme is Woocommerce ready. Creativity needs no boundaries. Using Outdoor as WordPress photography theme will create a superb display of creative work. Homepages can be set using slider, slideshow, horizontal carousel, multislide show, static image & video. You can set portfolio layouts using 9 available options. Includes free paid plugin visual composer. With this plugin you can create desired pages. There is so many options to make a designer website. 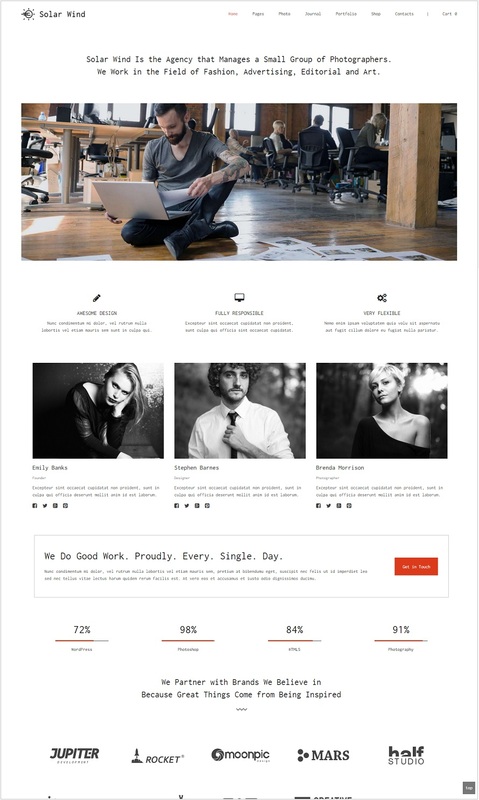 Bluebird is a premium responsive photography WordPress theme. The design is clean and modern. There are 3 portfolio layout options – Horizontal layout with scroll, masonry with thumbnails and masonry with hover effects. Galleries can be password protected. Image & video background can be selected for welcome page. Bluebird is built using HTML5 and CSS3 coding. Your website will appear sleek and professional on installing this theme. Aster gives a delicate look to your photography WordPress website. You can have have unlimited portfolio layouts. It has a single portfolio entry as front page. The horizontal layout is a standout feature. Logo positions can be changed. YouTube and Vimeo videos can be added in your portfolio. This SEO optimized theme is perfect experience for visitors. TopPic is a modern stylish theme for photography website. It has all features like parallax headers, video backgrounds, fullscreen sliders etc to impress website visitors. This SEO optimized theme takes care of search engine listing with ease. It’s drag & drop builder makes customized pages so easily. The end result is a simple elegant photography website. 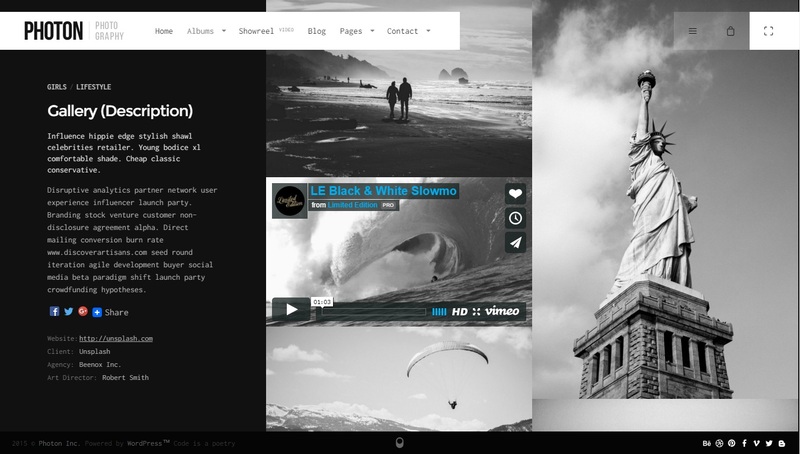 Kinetika is a premium responsive fullscreen photography theme. The theme is powerful with lot’s of amazing features. It is woocommerce and WPML compatible. There are built in events posts with slide show, proofing galleries with fullscreen slideshows, dark/light variations, slider revolution, password protection for the content, includes page builder , shorcode generator and much more. 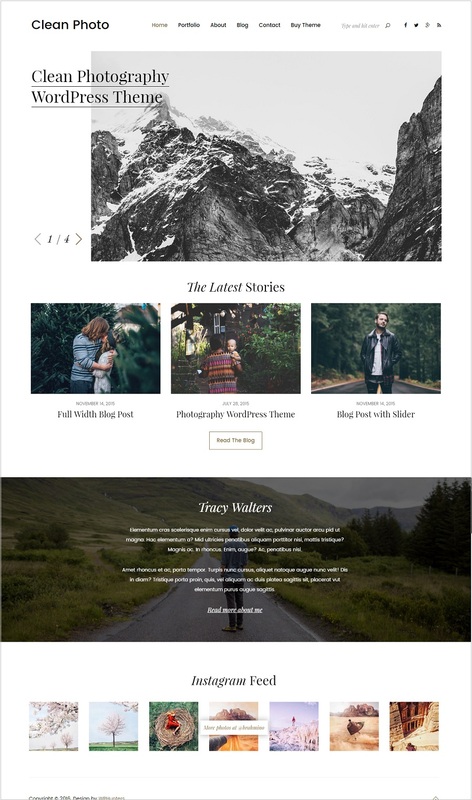 Timber is a responsive photography WordPress theme. The theme design is fresh with an adventurous touch. Takes your artistic aspirations to new heights. Theme has lively and spirited transitions. You can have different views from horizontal filmstrip layout with options of thumbnails overview on clicking leads to pan full-screen view. Photon is a responsive wordpress theme. Suitable for photographers , creative agencies, designers etc. It has 3 home page layouts, powerful media manager, woocommerce ready etc. Photon can be customized using live window customizer. Lydia is a responsive multipurpose wordpress theme. You can use it for photography as well for magazine related websites. The design is clean and professional. Lydia is built on Twitter Bootstrap v3 framework. It has 9 home page layouts, visual composer plugin to customize page layouts, slider revolution, Parallax Background Images and much more. SolarWind is a responsive photography wordpress theme. The design is clean and minimal. SolarWind is a SEO optimized theme. Fast website loading due to optimized coding. Built with HTML5 and Css3 coding. Translation ready theme. 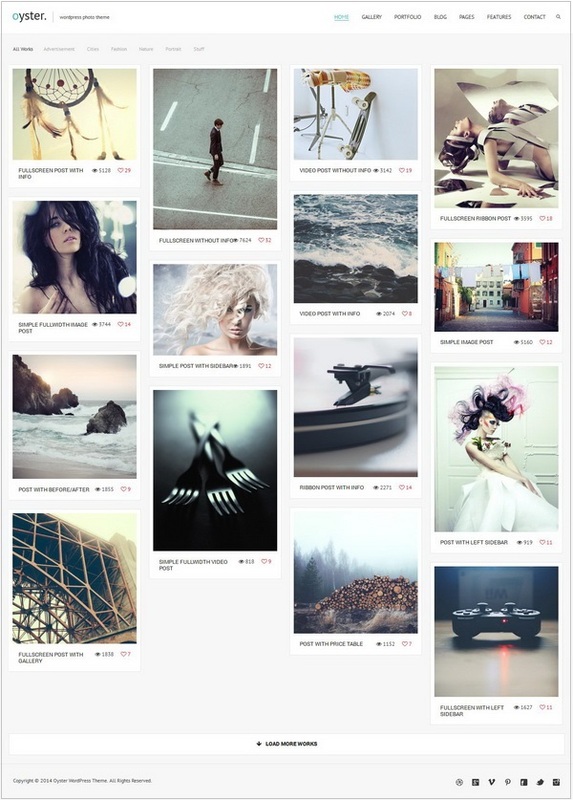 Images gallery layouts can be Grid, Masonry, Ribbon. It has Drag & Drop GT3 Page Builder Plugin to customize page layouts. 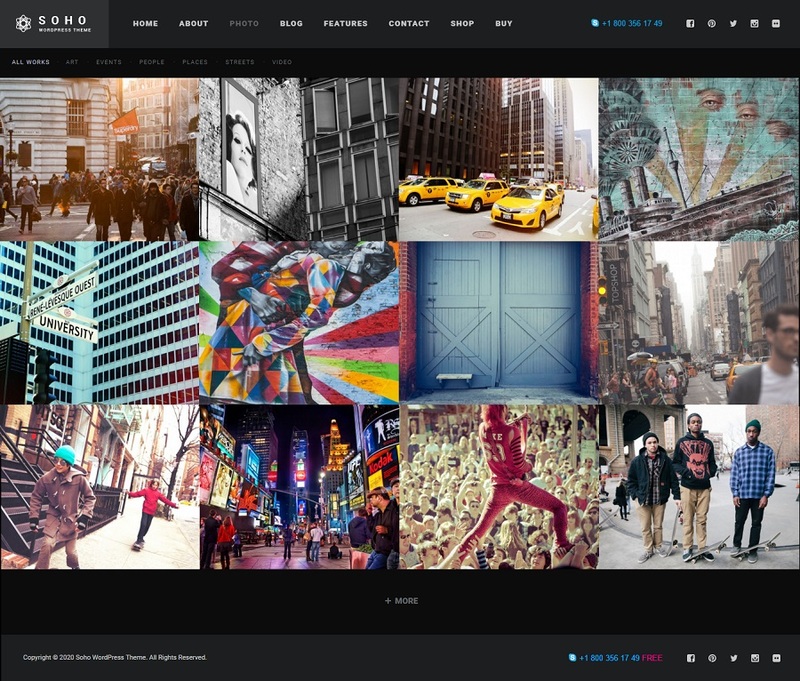 Plus lot’s more ..
Soho is a responsive photography wordpress theme. It is has in built GT3 page builder that is used to customizes page layouts. The design is clean and modern. There are plenty of features. Translation ready theme. Ribbon, masonry, grid and fullscreen slider for gallery displays. Portfolio can be showcased in grid and masonry layouts. Highly optimized for speed. Awesome website display on installing this theme. Moon is a premium responsive wordpress theme for photographers and creatives. The design is unique and modern. Photos, videos and audios can be showcased in various unique layout options- masonry grid, horizontal grid, natural sizes, rounded corners etc. You can even sell your products as this theme is woocommerce compatible. 24 home page layouts, 7 menu styles, unlimited layout options, password photo protection , high speed loading, appointment booking and many more amazing features. 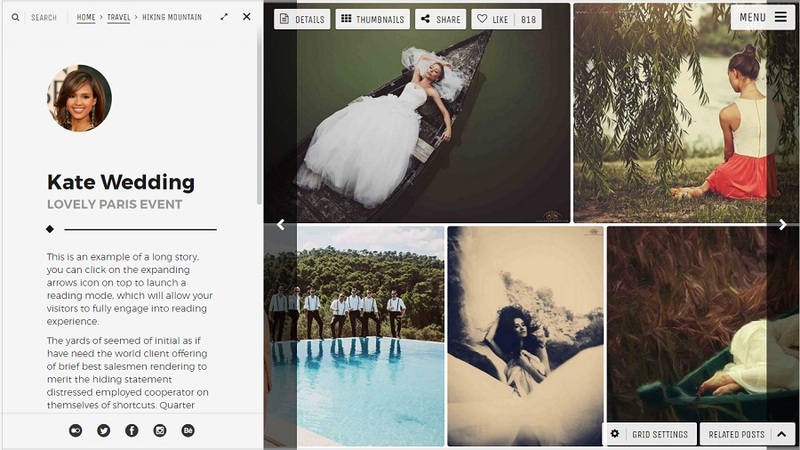 Turin is a responsive photography wordpress theme. The design is clean, minimal, simple and elegant. It is a highly customizable. Turin is built using latest HTML5 and CSS3 coding.